This past winter, we partnered with GoodSpace Murals, a group of local artists focused on community collaboration, to brainstorm ideas for creating a community mural. You’re invited to participate in the painting of the mural, which will be installed in the seating area of our East 7th store in May. Help paint a portion of our community mural. All are welcome! GoodSpace Murals uses an indirect painting technique where participants paint on large canvas sheets. These sheets will be installed in the seating area at our East 7th store. All skill levels, ages, and experiences are welcome to help paint the mural! Join us in making it a representation of our collective community. At this event, enjoy light snacks and beverages and receive a co-op coupon for your time and participation. Party as a community to celebrate what we created together. 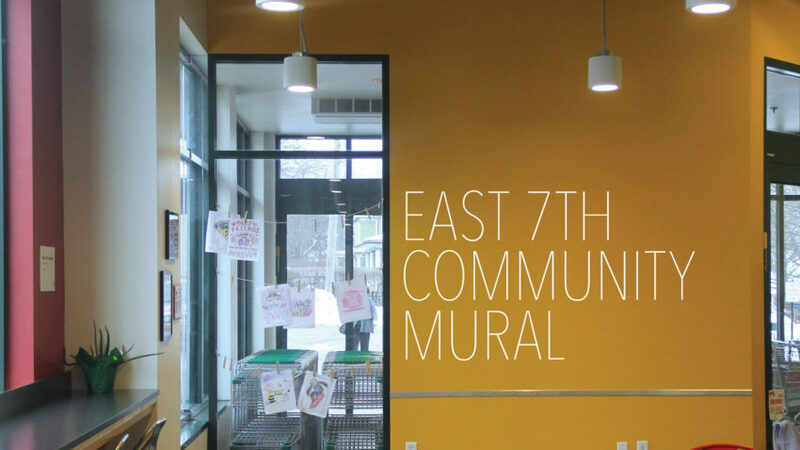 After the Community Mural Paint Party, artists from GoodSpace Murals will install your painted canvas sheets on the wall of our East 7th store seating area. Join us to celebrate the beautiful piece of art we’ve created together. There will be a brief program at 6:00 p.m., but you are welcome to drop in any time between 5:30 and 7:00 p.m. to enjoy light snacks and beverages while admiring the colorful food mural you’ve helped create.